As a result of its extended product pro- gram, Volvo Penta has been chosen as the complete engine supplier for a new series of tugs in the Ukraine. Volvo Penta's large marine diesel pro- gram and nine of which are six- to seven-liter engines. 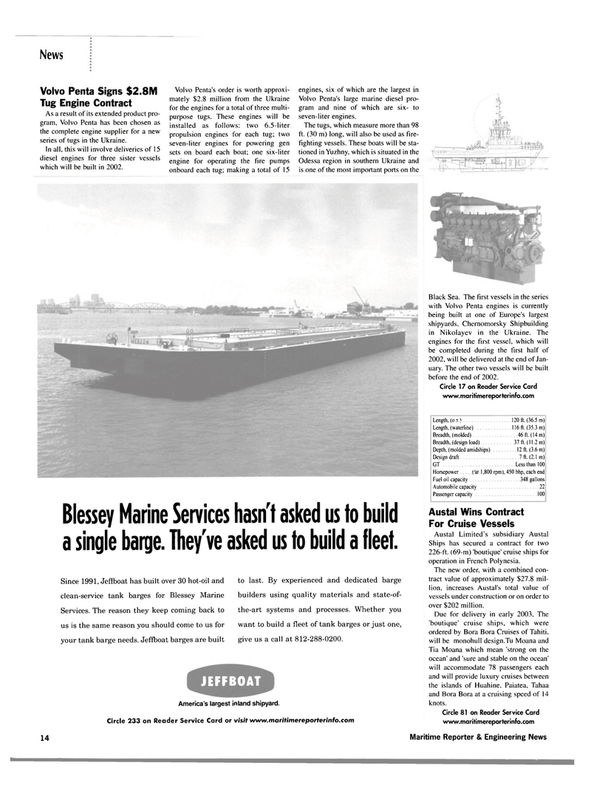 Blessey Marine Services hasn't asked us to build a single barge. They've asked us to build a fleet. Services. The reason they keep coming back to us is the same reason you should come to us for your tank barge needs. Jeffboat barges are built to last. By experienced and dedicated barge builders using quality materials and state-of- the-art systems and processes. Whether you want to build a fleet of tank barges or just one, give us a call at 812-288-0200. Black Sea. The first vessels in the series with Volvo Penta engines is currently being built at one of Europe's largest shipyards, Chernomorsky Shipbuilding in Nikolayev in the Ukraine. The engines for the first vessel, which will be completed during the first half of 2002, will be delivered at the end of Jan- uary. The other two vessels will be built before the end of 2002. Ships has secured a contract for two 226-ft. (69-m) 'boutique' cruise ships for operation in French Polynesia. The new order, with a combined con- tract value of approximately $27.8 mil- lion, increases Austal's total value of vessels under construction or on order to over $202 million. Tia Moana which mean 'strong on the ocean' and 'sure and stable on the ocean' will accommodate 78 passengers each and will provide luxury cruises between the islands of Huahine. Paiatea, Tahaa and Bora Bora at a cruising speed of 14 knots.